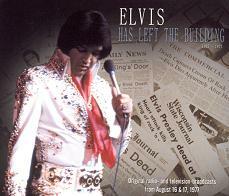 A 24-track CD containing different media coverage of the death of Elvis Presley. Here you will find fans reactions, celebrity comments and newsreports. As a bonus you will also find some seconds of backstage talking between Elvis and some Japansee fans. It all ends with an additional "little darling" not listed on the sleeve. The CD runs for almost 78 minutes. It is presented in a stylish way with several nice photes!